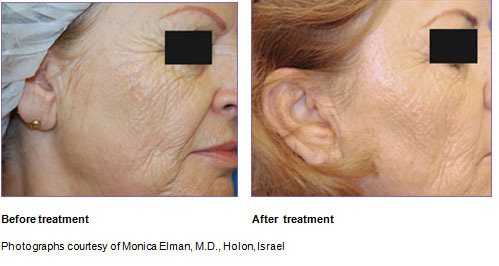 Achieve tighter, brighter, smoother skin with Fractional Skin Resurfacing (FSR). 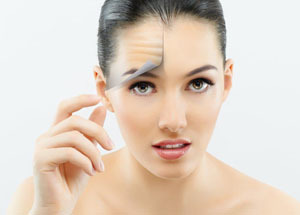 The natural aging process normally begins in the mid- twenties (20s). Premature aging may occur from photodamage caused by long-term sun exposure, environmental factors such as urban pollution, hereditary and lifestyle factors including smoking, alcohol consumption and poor nutrition. Collagen breakdown is accelerated, excessive melanin (pigment) is produced, hyaluronic acid (which helps plump the skin) slows down and free radicals break down skin cells. 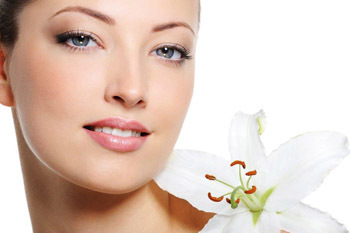 The result is fine lines and wrinkles, impaired skin pigmentation, texture and skin tone. 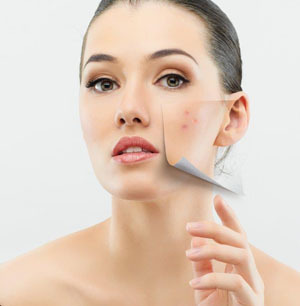 These problems, as well as certain other skin conditions may be improved by Fractional Skin Resurfacing (FSR). Resurfacing refers to the ablation or removal of skin tissue so new healthy tissue can be formed. Fractional skin resurfacing means that specific small areas, a fraction of the skin’s surface, are removed in a precise pattern leaving the surrounding healthy skin intact. The small sections of untreated healthy skin that are left intact facilitate rapid healing of the treated areas, resulting in very high patient satisfaction. EndyMed’s unique 3DEEP® technology signifies a new era in anti-wrinkle and skin tightening technology. It is clinically proven to deliver tighter, firmer, lifted skin, safely and effectively with little to no downtime. One of the main setbacks with fractional skin resurfacing has been that patients with darker skin risked de-pigmentation or hyper-pigmentation after treatment. Now, a new technology has emerged, the EndyMed 3DEEP® Fractional Skin Resurfacing (FSR), which uses radiofrequency (RF) energy that has been shown to be safe and effective on all skin colors, even tanned skin, and is capable of treating anything from melasma, skin laxity, deep wrinkles to scarring. It is the latest generation in the evolution of RF-based professional skin treatment devices. 3DEEP® technology safely modifies the collagen structure for a progressive long-term anti-wrinkle effect. Ituses a multi-source, radio frequency energy and sophisticated software that enables delivery of controlled heat deep into the skin, while preserving the overlying outer layer of the skin (epidermis). It uniquely controls the power and depth of the RF energy delivered to the skin. 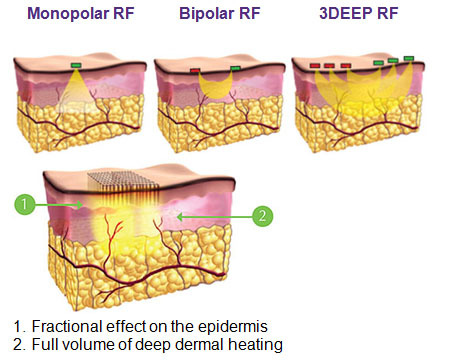 The 3DEEP® (FSR) handpiece contains a matrix of 112 tiny RF electrodes, with each possessing a 300 micron spot size, and this technology has six independent radio frequency sensors that generate pulses of RF energy that actually push the heat to deeper layers into the skin, allowing for the first time simultaneous epidermal (overlying outer layer of the skin) resurfacing for the improvement of skin texture together with volumetric heating of the dermis (middle layer of skin, beneath the epidermis ) for the promotion of collagen growth and remodeling with resultant reduction of skin laxity and wrinkles. Approximately half-hour before start of the EndyMed™ 3DEEP® FSR procedure, Dr.ChinQuee will have a numbing cream applied to the skin. Each pulse of energy applied to the skin delivers conducted radio frequency via a grid of 112 matrix spots. Without overheating the skin, 3DEEP® safely achieves superior dermal heating for long-term collagen remodeling. Each pulse will last for less than a second. Most patients experience a feeling of heat and slight prickling sensation during the procedure. The procedure usually takes only 30 minutes to complete. The skin will feel hot for an hour or more after the procedure and will have a red appearance resembling that of a mild sunburn. 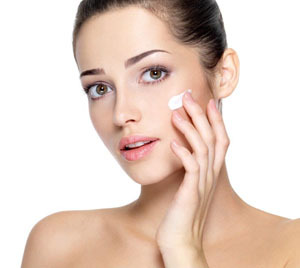 A recovery gel or cream may be applied to help soothe and calm the skin at this stage. Over the next few days, when the redness and swelling begins to fade, the “grid” marks (extremely tiny dots) will become noticeable. They will then turn to a faint brownish color. The skin will feel tight, itchy and also undergo a little scabbing, crusting and flaking which is completely normal and expected. This should normally be resolved after 5 to 7 days. 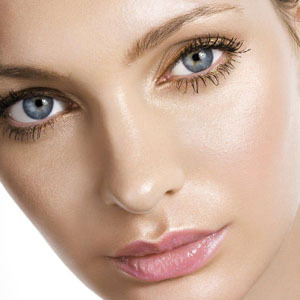 This can be easily managed with use of a regenerating moisturizer and mineral make-up. From one week onwards the benefit of the fractional skin resurfacing should start to be noticeable with a visibly smoother, brighter, more luminous appearance. The dermal heating will be stimulating new collagen formation which will start to re-model and tighten from 4 to 6 weeks onwards leading to a gradual improvement of fine lines, wrinkles, scars and stretch marks. Results are cumulative and improve over time.The results are on-going and long lasting due to natural changes in the skin as new collagen continues to be produced and significant dermal remodeling occurs over a period of 3 to 6 months after the procedure. It will take about 3 months after your last procedure for the full benefits to be realized . The results can be enhanced with high level SPF (UV protection), high quality skin care products, and periodic maintenance treatments. A course of treatments normally consists of 3 to 5 sessions spaced 4 to 6 weeks apart. The number of treatments required, however, will depend on the nature and severity of the problem. Dr. ChinQuee will consult with you to customize a treatment regimen.